Sedat Peker, a convicted gang leader and staunch supporter of Turkish President Recep Tayyip Erdoğan, said they will hang all people linked to the Gülen movement from flagpoles and trees, the Diken news website reported on Sunday. “They should pray for our president, who they call a dictator. May God save him [Erdoğan], if his visit to this world ends even in natural ways, they will see what a dictator is. God willing, we will hang all those who are sympathetic to them [Gülen movement], walked with them, not left them, on the nearest flagpole. We will hang them on the nearest tree,” said Peker during a visit to Çengelköy Martyrs cemetery in İstanbul. Many people who had been killed during clashes on the night of the failed coup on July 15, 2016 were buried on Cengelkoy cemetery. Peker’s statement came a day after Erdoğan targeted people linked to the Gülen movement while speaking to a crowd of thousands at the July 15 Martyrs’ Bridge on the anniversary of the failed coup attempt. “We’re not just some nomadic tribe, we are a nation. They, however, are a disease, disease. That’s the difference,” said Erdoğan. “First we will cut off traitors’ heads,” said the president while underlining that there were other powers behind the movement, who Erdoğan accuses of masterminding a coup attempt in Turkey on July 15, 2016. Meanwhile, pro-Erdoğan news website Haber7 called for an Ottoman-like solution for the execution of people linked to the Gülen movement. “This is an example of execution in the days where decisions were taken without losing time on investigations, interrogations and court procedures for people who rebelled against the state,” said news website Haber7 in a tweet on Sunday posted with a headline reading “The ideal execution method for FETÖ [a derogatory term coined by Erdoğan and the government to refer to members of the Gülen movement] was used by the Ottomans” along with an Ottoman miniature depicting the execution of people hung by hooks in their stomachs. 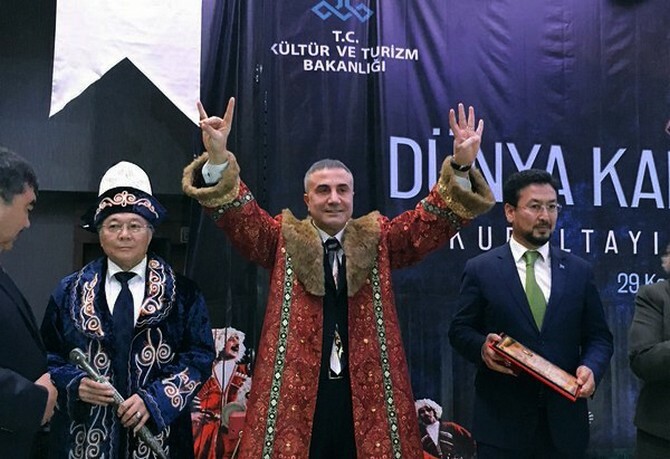 In May, Peker was given the “Most Benevolent Businessman” award by the Milliyet daily, run by the Demirören Group, which is close to Erdoğan. Peker is notorious for his threats against Erdoğan critics and opponents. In a social media message in January, Peker declared his support for the transition to an executive presidency in Turkey while threatening those who were against holding a referendum to vote on the change in the country’s system of governance. Gang leader Peker, who has been convicted of several crimes, had also threatened academics who signed a petition calling for peace in early 2016. “We will spill your blood in streams and we will shower in your blood,” said Peker, in a message titled “The So-Called Intellectuals, The Bells Will Toll for You First,” posted to his personal website on Jan. 13. This article originally appeared in Turkish Minute on July 16.